MOORESVILLE, N.C. (December 16, 2013) – Turner Scott Motorsports (TSM) is pleased to announce the addition of Ben Kennedy to its 2014 NASCAR Camping World Truck Series (NCWTS) roster. The 21-year-old will drive a full-time championship campaign while competing for Sunoco Rookie of the Year honors behind the wheel of the No. 31 Chevrolet Silverado. Michael Shelton, who led the No. 31 team to TSM’s first championship in 2012 with driver James Buescher, will continue his role atop the pit box. Kennedy made his NCWTS debut for TSM in 2013, earning a best finish of fourth at Martinsville Speedway. Kennedy, who began his racing career on the short tracks of central Florida, has Pro-Truck championship titles at both Orlando Speedworld and New Smyrna Speedway, which he earned in 2009, followed by the Super Late Model championship at Orlando Speedworld in 2010. The great grandson of NASCAR founder Bill France, Sr., Kennedy made his touring series debut in the NASCAR K&N Pro Series East (NKNPSE) in 2010. Kennedy began racing full time in the NKNPSE in 2011. In 2012, Kennedy competed in the first NASCAR-sanctioned Euro Racecar Series event, winning the event at Tours Speedway, the first NASCAR race held on an oval in Europe. Kennedy experienced his most successful NKNPSE season to date in 2013, finishing fourth in the Driver Point Standings on the strength of two wins, one pole, three top fives and nine top 10s in addition to being crowned as the series’ Most Popular Driver. Kennedy was selected for the NASCAR Next program in 2013, an initiative to spotlight the sport’s up-and-coming stars. The Daytona Beach, Fla. native is also completing his Sports Management degree at the University of Florida. 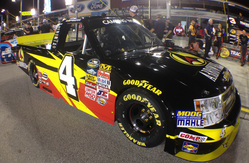 Turner Scott Motorsports has earned two championships in the last two seasons, beginning in 2012 with Buescher’s NCWTS title. TSM captured the NKNPSE championship in 2013 with Dylan Kwasniewski behind the wheel. 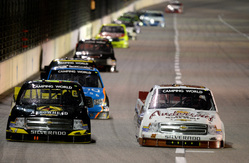 In 2013, TSM’s Truck Series program totaled four wins, ten poles, and finished the season with all three of its full-time trucks in the top 10 for the second-consecutive season. The 2014 NASCAR Camping World Truck Series season kicks off on Friday, February 21 with the NextEra Energy Resources 250 at Daytona International Speedway. 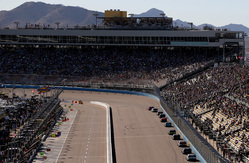 The race will air live on FOX Sports 1 and MRN at 7:30 p.m. EST.